Prospecting Training Materials are designed for trainers to develop the skills of the sales and management team so they can prospect for leads like a pro! Train your employees eight ways to target your market, why networking and prospecting is important, how to regain lost accounts and more! Seeing is Believing This sample manual to teach Prospecting for Leads like a Pro is in MS Word format. Some salespeople balk at the thought of prospecting, preferring their referrals to send them new business, or believing that prospecting is nothing but unproductive busy work. But with the right training, prospecting for leads can provide today’s sales professional with the tools to make prospecting effective, strategic, and personable. Students learn the benefits of efficient prospecting, how to generate more sales leads, and learn sales prospecting methods that will help build their network, meet new clients, deliver their messages, and develop sales relationships as they prospect for new customers. 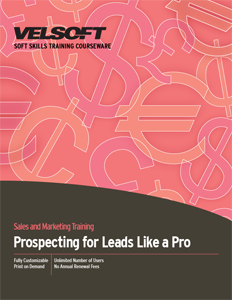 Velsoft’s Prospecting for Leads Training Materials are readily customizable for trainers who want to deliver up-to-date content, or it can be taught directly! Prospecting for Leads Like a Pro includes an instructor’s guide, a study guide for students, pre- and post-course assessments, and examples of effective prospecting methods to help students learn how to get the qualified leads they need. Instructors can also use Velsoft’s eLearning website to further enrich their training material by creating a blended learning solution. Staff can learn independently, on-the-go, and continue to perfect their techniques for sales prospecting, bringing the classroom with them wherever they are.